Io is the closest thing we have to hell in our Solar System, a Jovian moon that features hundreds of active volcanoes and expansive lakes filled with lava. New observations suggests that the largest of these lakes, Loki Patera, produces enormous waves that repeatedly flow around the molten surface. Thanks to a rare orbital alignment between Europa and Io, an international team of researchers has identified and tracked a pair of lava waves as they coursed around Loki Patera, which is larger than Lake Ontario, and with a surface area of 8,300 square miles (21,500 square km). The most likely explanation for this apparently periodic wave action is an overturning circulation pattern, in which cool surface crust slowly thickens and sinks, pulling nearby crust along with it in a wave that spreads across the surface. These findings are set to appear in the May 11 edition of Nature. 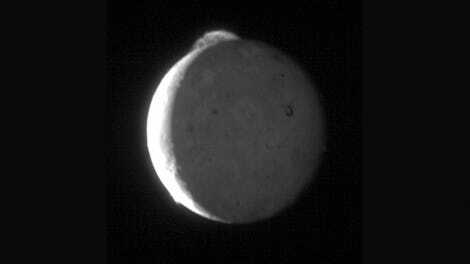 Back in the 1970s, scientists began to suspect that Io—Jupiter’s fourth largest moon—featured a tumultuous and dynamic surface. 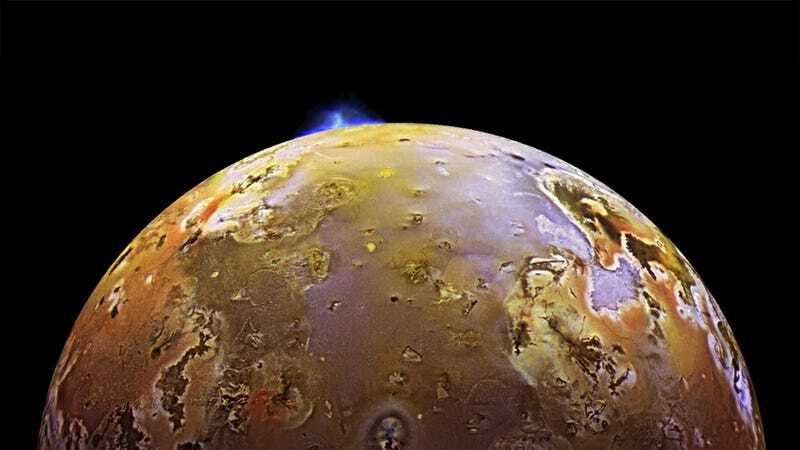 When the Voyager 1 and 2 space probes visited the Jovian system in the late 1970s, these suspicions were confirmed, revealing Io as the most volcanically active object in the Solar System. This tortured moon is embroiled in a gravitational tug-of-war between Jupiter and other Jovian satellites, causing intense tidal heating within its interior. 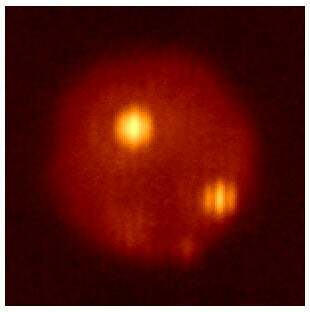 One of the most curious things to come out of our observations of Io is the periodic brightening seen at Loki Patera every 400 to 600 days. The two prevailing theories include eruptions, which spread lava flows over a large area, or overturning waves of lava. The new study, led by researchers from UC Berkeley, would seem to suggest it’s the latter. On March 8, 2015, Europa passed in front of Io from the perspective of Earth, gradually blocking out light from the volcanic moon. In stark contrast to Io, Europa is covered in ice, which reflects very little sunlight when viewed through infrared wavelengths. This rare event was not lost on the researchers, who were hoping to track this eclipse and measure the heat emanating from volcanos on Io’s surface. To do so, they used the twin 8.4-meter (27.6-foot) mirrors of the Large Binocular Telescope Observatory (LBTO) in the mountains of southeast Arizona. As Europa eclipsed Io, LBTO captured the incoming infrared light. This data was sliced into one-eighth-second intervals as the limb, or edge, of Europa slowly advanced across Io. The researchers compiled a two-dimensional thermal map showing the temperature distribution along the patera, and at a resolution better than 6.25 miles (10 km). Analysis of the data showed that the surface temperature of Loki Patera steadily increased from one end to the other, suggesting that lava had overturned in two waves that swept from east to west at a rate of 3,300 feet (1 km) per day. Observations also showed that the overturning was initiated at different times on the two sides of the cool island at the center of the patera, hinting at complex geological process beneath the surface. Fascinatingly, as the crust breaks apart, it’s possible that magma spurts upward in fire mountains, similar to what’s seen on a much smaller scale in lava lakes here on Earth. Looking ahead, the researchers are hoping to make more observations to confirm the patera is indeed a lava-filled lake, to confirm the cyclical nature of its overturning waves, and to possibly capture similar events in other pateras. Thankfully, the researchers won’t have to wait terribly long. The next occultation event between Europa and Io is scheduled for 2021.